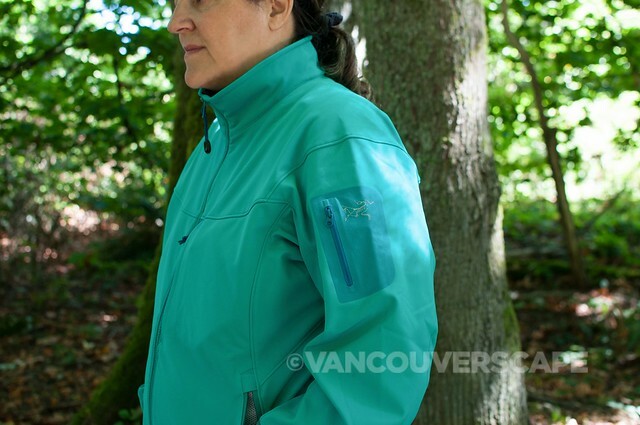 I’ve been looking for a comfortable, breathable softshell for Vancouver’s upcoming rainy/cool season, and found my answer in the Arc’teryx Gamma MX jacket. I recently wore it on a few local trails for a test drive. The Gamma MX is cozy with a super-soft neck lining that will keep me warm during our soon-to-be chilly Vancouver days and nights. 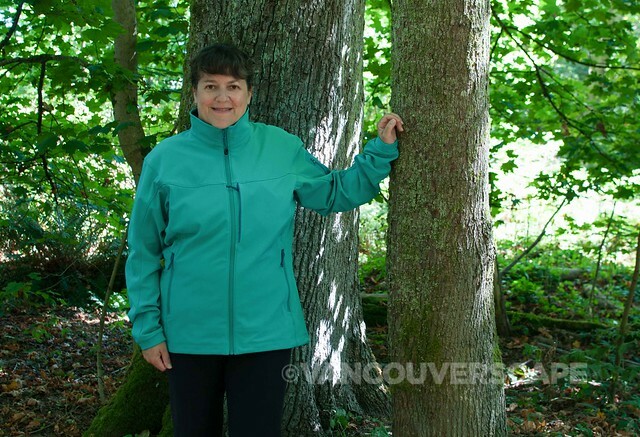 I’m also betting on getting a lot of mileage from this jacket on winter hikes and snowshoe outings once our local mountain peaks begin to whiten. 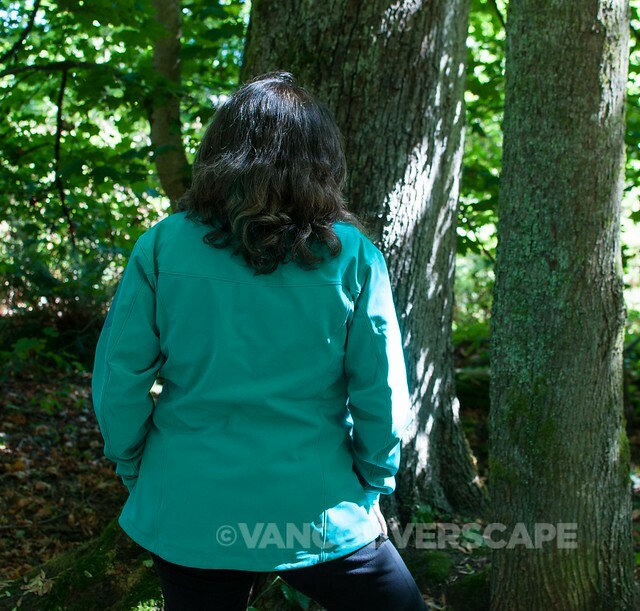 The jacket is very versatile, solidly constructed, and perfect for Vancouver’s ‘three-season’ climate. 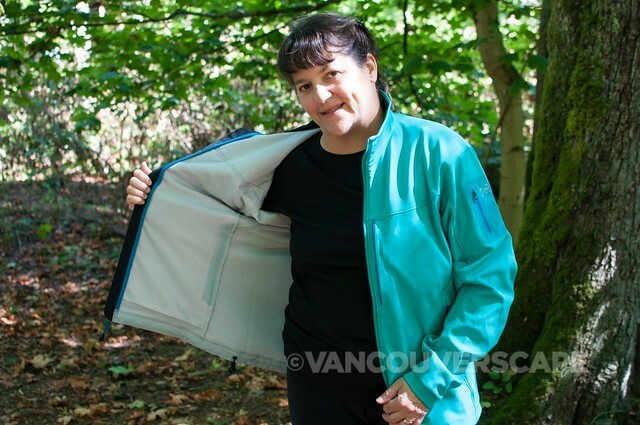 Though lightweight, it will stand up to chilly nights out on the town and on my bike. From light rain to snow, the Gamma MX is an excellent choice for staying warm with the ability to keep active through its flexible, breathable construction. The slim-cut Gamma MX is also wind-resistant and is great for alpine climbing and cross-country skiing. It folds up small enough to fit into a large backpack. 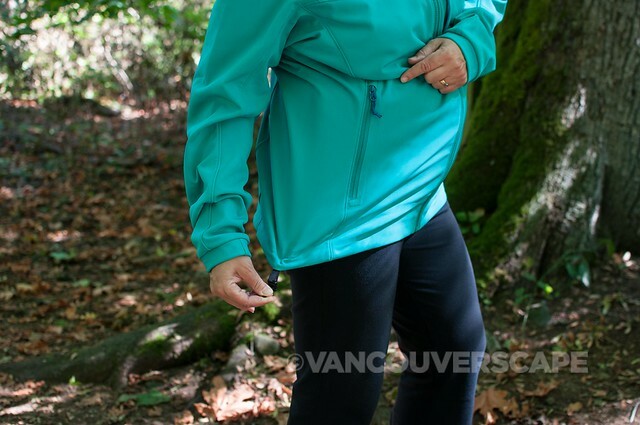 While this jacket isn’t Gore-tex by any means, its Durable Water Repellent (DWR) finish helps repel water, with a membrane-free, air-permeable, four-way stretch woven nylon/spandex fabric laminated to a low profile, mid-weight four-way stretch fleece. I also like this jacket for its sleeve length. My arms are typically too short for many shells and lightweight winter jackets. The construction on this one allows me to keep it right at the wrist, as well as letting it fall lower to keep my hands warm. I’d considered a Gore-tex Arc’teryx jacket such as the Beta LT Hybrid for its waterproof technology, but wanted a little warmth as well. This is the best combination of all the 2014 fall line that I found for keeping me happy on both counts, a smart-looking jacket suitable for a range of temperatures. The Gamma MX is easy to care for: machine-wash in cold water, and tumble-dry on low heat. It retails for CDN $300 and is available in Sea Glass and Heron (grey). A similar model with a helmet-compatible hood, the Gamma MX Hoody, is available for $350 and comes in two additional colours, Blackbird (black) and Roseberry (reddish/dark pink). 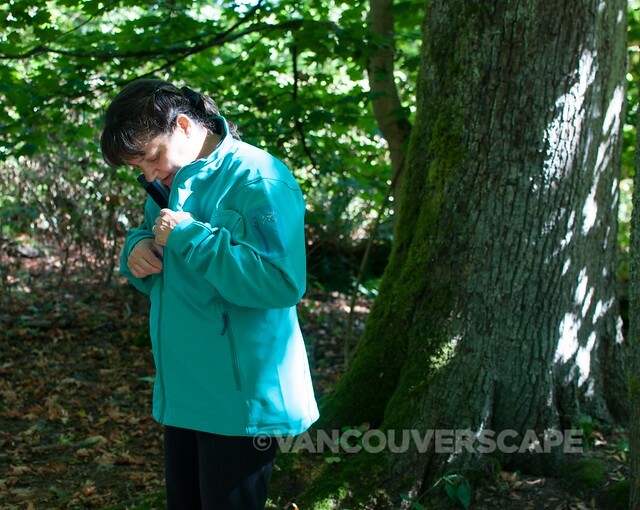 Both jackets range in size from XS-XL. I was sent the Gamma MX jacket for the purpose of test-driving it for this review.